若我要用IE開flash 8 的swf，那要在根目錄下開個Trusted目錄嗎? ex: \windows\Trusted 然後將swf放進該目錄再用PIE開啟?? 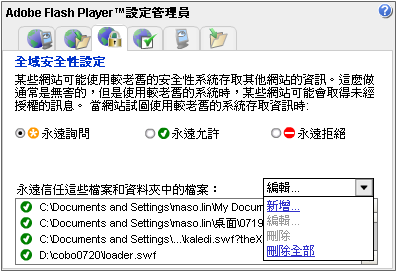 我survey一堆網路上的flash資訊，有些人說要將swf嵌入html，有些人說要裝 flash lite 2.1 player....可是目前這些方法都不行開flash 8的swf. 因此想請問你是否能給些意見，謝謝! !